The club, which was established in 1922, has around 400 members, the majority living in Bolton and surrounding areas. 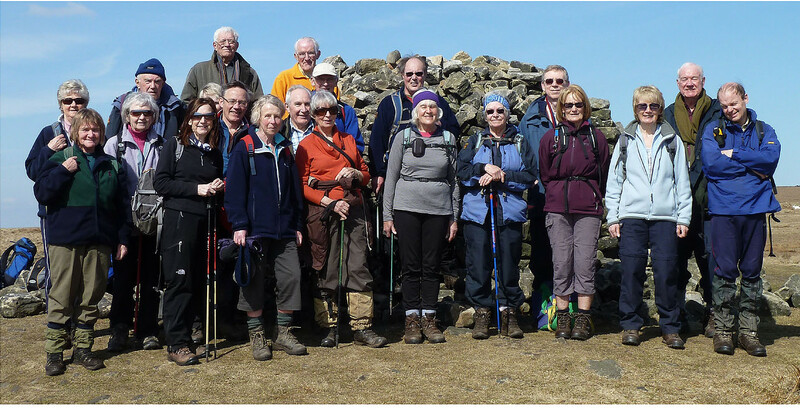 The club’s main aim is to foster enjoyment and appreciation of the countryside which we do principally through a regular and varied programme of walks sent out to members every two months. Details of forthcoming walks are available via the Walks Programme menu option above. The club is open to walkers, aged over 18 years of age, for an annual fee of £11. payable when joining and on 1st March annually. Unfortunately, dogs are not allowed on walks. We welcome new members. If you are interested in becoming a member then please get in touch with us via the Contact Us menu option. If you wish to try us out before joining then please turn up on a walk and introduce yourself. If you want to try a Sunday walk, please contact us first via the Contact Us menu option, giving your telephone number, and the walk’s leader will contact you. The Club runs walks on 3 days each week, Wednesday, Saturday and Sunday, with an additional walk on Thursday evening in the summer. The walks are of variable lengths. Monthly Longer Walks (normally 14-16 miles) are organised on Fridays from April to October. If any HF members are interested in joining these walks. please contact us via the Contact Us menu option. There can be 5 Wednesday walks, which are graded according to distance and difficulty: All walks start at 10.30 a..m. , except for the No 1 Walk which starts at 10.00 a.m. The Thursday evening walk starts at 7.15 p.m., is between 5/6 miles and finishes at 9.15 p.m. at a local pub. The Saturday walk starts at 1.00 p.m. and is usually 6 to 8 miles. The Sunday walk starts at 10.30 a.m. (10.00 a.m. during winter months) and varies from 8 to 13 miles. All walks are led by Club Members. Most walks are circular. Walkers find their own way to the starting point which is shown on the Walking Schedule. However, we encourage members who live near one another to share transport and costs, if possible. Coach trips run usually on a Wednesday in May, July and October. Social events are also arranged, which include an annual dinner, a lunch and a Celidh. Walkers are expected to be reasonably equipped and it is essential to have boots and a waterproof jacket and trousers. Prospective members are welcome to try the walks before actually joining, subject to acceptance of the Club’s Code of Conduct. The Club’s Code of Conduct is available via the Code of Conduct menu option and your attention is particularly drawn to the Club’s position on risk, liability and insurance.